Notes | An award-winning photographer who had unprecedented access to Bill Clinton and his staff for a full year presents an intimate insider's portrait of the successful campaign. Comments | [10/03/02] This is a terrific look at the former president by the newest member of the Brooks Institute faculty. 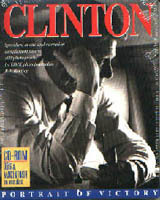 Bentley had amazing access to the early Clinton years and capitalized on it, culminating in this ground-breaking book in wonderful black and white.